Unlike the penguin, which mates for life, chances are the average Quinnipiac Bobcat will not settle down during its four years of college – especially if it is a female. Quinnipiac currently enrolls 2,253 undergraduate men and 3,735 undergraduate women, according to the Office of Admissions. Therefore, the ratio is approximately 19/31. In a typical year, there are nearly double the amount of female applicants compared to males. Last year’s numbers clocked in at 11,819 female applicants and 6,821 male applicants. 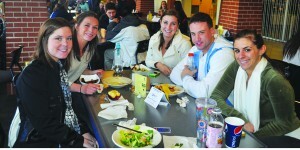 The uneven girl to guy ratio makes itself evident at Quinnipiac, even in the cafeteria. “I mean, of course it’s a lot easier for guys to find girls to either date or hook up with because we are in the minority,” freshman Mike Rocchio said. The guy-to-girl ratio affects the dating atmosphere on campus in many ways, from the random hookup mentality to the hopes of forming a serious relationship. According to Hoffnung, the gender imbalance on campus contributes to multiple aspects of Quinnipiac’s dating culture, one being the notion of, “the more you score, the better,” which is prevalent in our culture among young men in general. This could lead to more superficial relationships, she said. Sophomore Tori Rice said that from what she’s seen on campus, many guys and girls just hook up, and it rarely becomes something permanent. Meaningless hookups may resonate with many Quinnipiac students, as nights out in New Haven notoriously end with a story or two. However, students’ tendencies to go out to New Haven every weekend may also mean something else. Senior Sonia George stated that many girls don’t go out because they want to hook up, but to even out the ratio and potentially meet guys from other schools. “A lot of my friends have boyfriends that don’t go here. They met them out,” George said. Hoffnung stated that fortunately, Quinnipiac’s campus is not a closed community. Therefore, there are many opportunities to meet people outside of college, such as at an internship. While the gender imbalance seems to contribute to frequent hookups, it may also affect the standards that women set for themselves. Hoffnung added that there may be benefits to this, as well. In these cases, women may discover other qualities that are important to them besides those they originally had in mind. Men, however, don’t need to be as concerned with standards. “I think it’s tough for guys to actually date girls because there are so many options. It’s hard to tie yourself down to just one when there are a lot of single girls,” sophomore Tanner Tamsin said. Tamsin also said that girls hook up to potentially form a committed relationship. “If you are hooking up for a while, girls usually want to date,” Tamsin said. Rocchio stated that if girls do find a guy they really like, they hold onto them because it’s harder to find someone else. According to Hoffnung, however, holding onto someone isn’t related to gender. If the ratio were in a woman’s favor, these roles would be reversed. “If the imbalance were in the other direction, men would try to hold on to women they like because there were fewer choices,” Hoffnung said. Hoffnung advises that dating in college shouldn’t be a major concern. Ultimately, most people don’t marry their college boyfriends or girlfriends, Hoffnung said. She has also done research showing that women in all-women colleges marry at the same rate as those in co-ed colleges. According to the Pew Research Center, the average age for marriage among men is 28, and 26 among women. The research shows that most people marry someone they meet in graduate school or in the work place, for example. “You are more likely to marry people you meet when you are about ready to get married,” Hoffnung said. While Quinnipiac’s dating scene may be difficult for some to master, committed relationships can exist on campus. Junior Evan Soderhom met his girlfriend walking the halls of Commons freshman year, he said.